Update: The fast-forward button is the „up navigation button“ during the play of a movie. Thank you Richard for the hint! 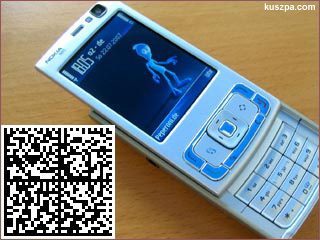 The Nokia N95 also has some gimmicks like a radio, which works quite well also in a train, and 2D barcode scanner. The detection of barcodes (like the one in the picture above) is amazing easy. If you want to make your own ones, try the 2D Barcode Generator for URLs by Andreas Bischoff.